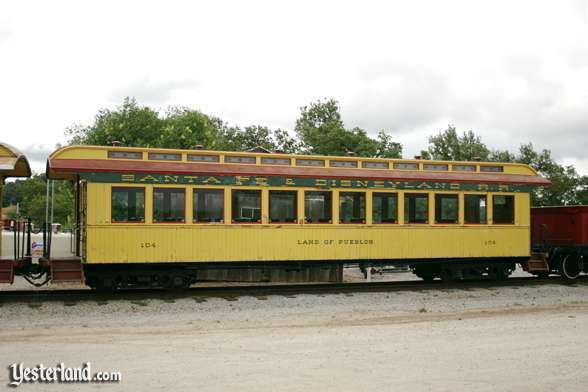 The Painted Desert coach is one of six coaches of the Passenger Train. The Santa Fe & Yesterland Railroad has two stations—the Main Street Station and the Frontierland Station—each offering a nonstop round trip journey on a different train. The old-fashioned Passenger Train departs only from the Main Street Station. The locomotive E. P. Ripley, named after the president of Santa Fe Railroad from 1896 to 1920, most often pulls the enclosed, yellow coaches. 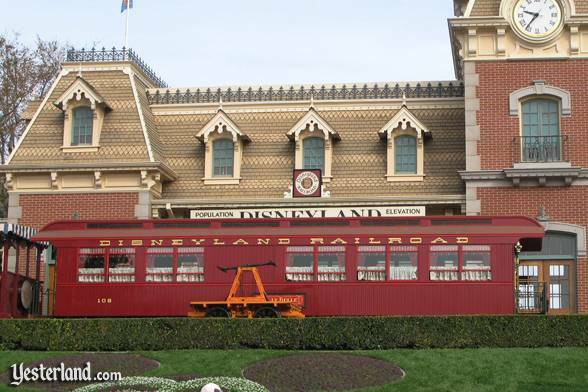 The 1890s style Passenger Train matches perfectly with the era of the Main Street Station. Each coach has a name—the Navajo Chief, the Rocky Mountains, the Land of Pueblos, and the Painted Desert. The fifth coach is an observation car, the Grand Canyon, with a different window pattern than the others and an open platform at the rear. Theres also sometimes a combination car, with passenger seating and a baggage compartment. The Freight Train departs only from the Frontierland Station. It has three cattle cars, two open freight cars, and a caboose. Its locomotive is usually the C. K. Holliday, named after the first president of the Santa Fe Railroad. The Freight Train fits right in with the rustic look of Frontierland. The locomotive C. K. Holliday passes the Grand Canyon observation car. I have a suggestion for you. Try to get a seat on the right side of the aisle, as you face the front of the train. That way, youll have great views of the park from your window. The windows on the left side have views of the parking lot, backstage areas, and orange groves. Your nonstop ride goes all the way around the park. You could pass the Freight Train, or it could pass your Passenger Train. Even though most of the route is served by a single track, there are track switches and sidings that make it possible for trains to pass each other. It takes skillful brakemen to operate those switches. 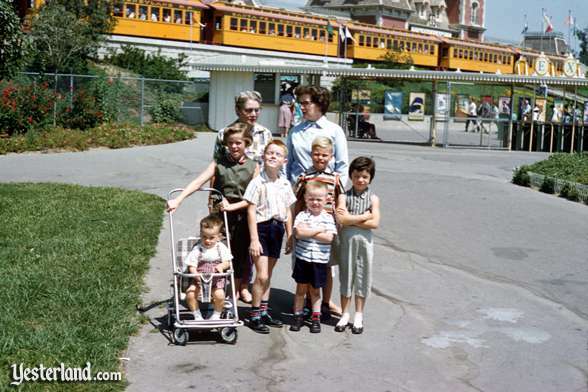 A family poses outside the park with the Passenger Train in the background. Finally, you return to Main Street Station. Now, how about going over to the Frontierland Station for a ride on the Freight Train? 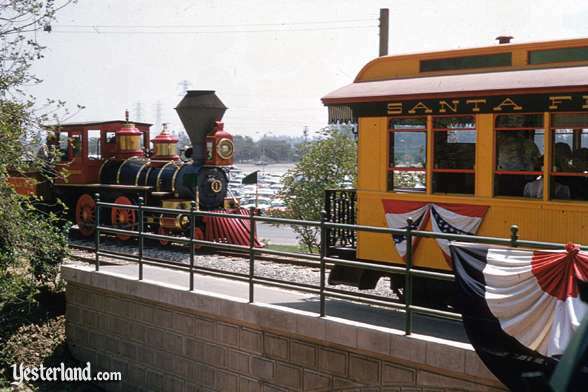 The Santa Fe & Disneyland Railroad opened at Disneyland in 1955 with two trains and two train stations. It was one of the parks top rides. At a time when general admission to Disneyland was one dollar (and before there were tickets and ticket books), the adult train fare was 50 cents. The two trains might have looked like well-restored antique trains, but they were brand new in 1955. The passenger coaches were built on a soundstage at the Burbank studios of Walt Disney Productions. 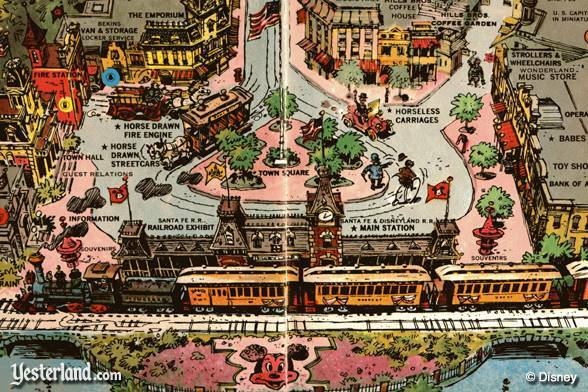 Scanned image of a small section of the 1962 Disneyland souvenir map. A third train joined the Santa Fe & Disneyland Railroad in 1958, which was also the year that the spectacular Grand Canyon Diorama opened. The Fantasyland Depot (1956-1966) and the Tomorrowland Station (1958-present) joined the two original train stations. Instead of having one train operate nonstop from each station, each train was stopping at each station—which is still how it is today. 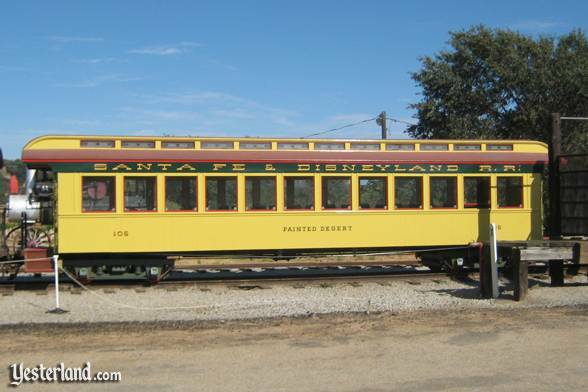 The yellow coaches of the Passenger Train operated at Disneyland until 1974. However, after the early years, they only ran on busy days or when another train was out for maintenance. It may have been a great looking train, but the other trains could unload and load passengers more quickly, and they provided better views—especially of the Grand Canyon Diorama. Now, more than 50 years later, the Disneyland Railroad (as the Santa Fe & Disneyland Railroad was renamed in 1974) is still a popular ride. There have been many changes over the years. The route of the track was changed in the early 1960s for the addition of New Orleans Square and the mid-1960s for its a small world. Santa Fe ended their sponsorship in 1974. With the opening of the Videopolis Station (1985-1993), which became the Toontown Station (1993-present), the Disneyland Railroad again had four stations. And, of course, the scenery from the train changed as Disneyland changed. The opening day locomotives E. P. Ripley and C. K. Holliday are still operating. What about the original Freight Train? Its still operating too. The Freight Train was modified so that passengers are no longer behind cattle car slats. Its one of the current excursion trains with bench seats facing into the park. Passenger coach Land of Pueblos (in 2007). The picture above and the three pictures below are from 2007—a third of a century after the yellow coaches stopped running at Disneyland. Passenger coach Navajo Chief (in 2007). After 1974, the folks at Disneyland transformed the Grand Canyon observation car into the Lilly Belle parlor car for VIPs. 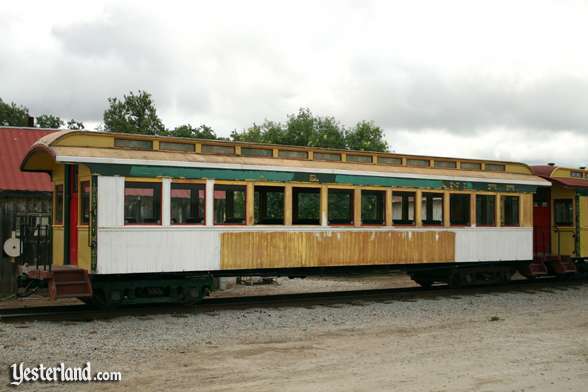 The combination car and the other four coaches were stored backstage for over 20 years. The former passenger coach Rocky Mountains—now Mary Frances (in 2007). Then, in 1995, Disneyland worked out a trade with Bill Norred, a railroad enthusiast. Norred would receive the coaches from Disneyland, and Disneyland would receive a steam locomotive from Norred. Rob Rossi, president of the private Pacific Coast Railroad, bought the Navajo Chief, Rocky Mountains, Land of Pueblos, and Painted Desert in 1999 from the family of Bill Norred, who died in 1998. The Norred family kept the combination car. 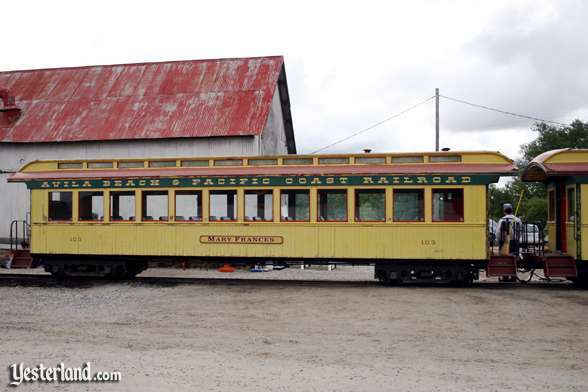 The Pacific Coast Railroad is restoring the coaches. 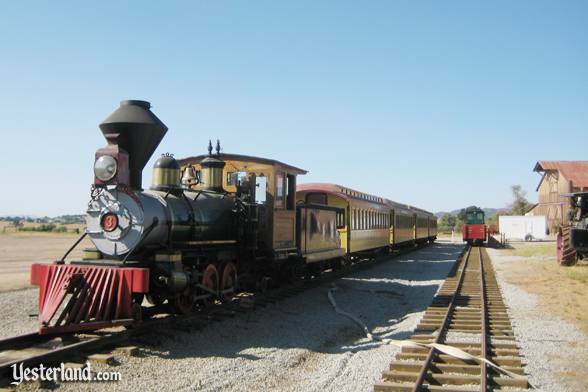 There are sometimes occasions when the public can ride in them, such as each year in early May at Pacific Coast Railroad Roundup at Santa Margarita Ranch to benefit the San Luis Obispo Railroad Museum. The former passenger coach Painted Desert, partially painted with primer (in 2007). A year after the restoration-in-progress picture above, the passenger coach Painted Desert and the entire train both look great, as the two pictures below show. The passenger coach Painted Desert, restored (in 2008). 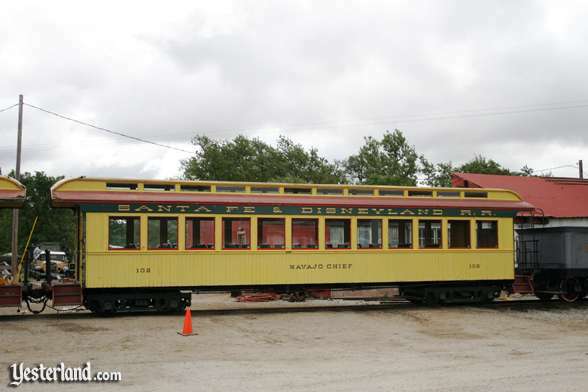 The restored Santa Fe & Disneyland R.R. Passenger Train (in 2008). The only car from the old, yellow Passenger Train thats still at Disneyland is the former Grand Canyon, now the Lilly Belle. The car is no longer yellow. After a thorough (and much needed) restoration completed in February 2006, the Lilly Belle once again looks great, as the next two pictures show. 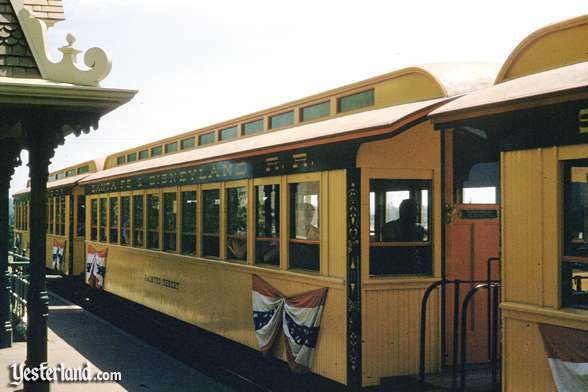 The Grand Canyon observation car is now the Lilly Belle parlor car. 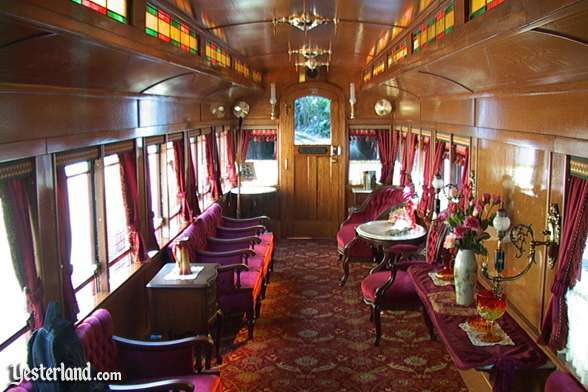 The Lilly Belle parlor car has an opulent interior for VIP guests. Photo of Passenger Train (primarily the Painted Desert coach): Charles R. Lympany, courtesy of Chris Taylor. Photo of locomotive and back of parlor car: Charles R. Lympany, courtesy of Chris Taylor. Photo of guests posing with the Passenger Train in the background: Charles R. Lympany, courtesy of Chris Taylor. Scanned image of a small section of the 1962 Disneyland souvenir map: Copyright 1962 Walt Disney Productions (The Walt Disney Company), and is included here for historical illustration. Photo of passenger coach Land of Pueblos: 2007 by Ted Van Klaveren. Photo of passenger coach Navajo Chief: 2007 by Ted Van Klaveren. Photo of former passenger coach Rocky Mountains—now Mary Frances: 2007 by Ted Van Klaveren. Photo of passenger coach Painted Desert—partially painted with primer: 2007 by Ted Van Klaveren. Photo of passenger coach Painted Desert—restored: 2008 by Mark Van Klaveren. Photo of the Santa Fe & Disneyland R.R.—restored: 2008 by Mark Van Klaveren. Photo of parlor car Lilly Belle at Disneyland: 2007 by Werner Weiss. Photo of interior of parlor car Lilly Belle at Disneyland: 2006 by David Lane.